These are Clan War figures from AEG. 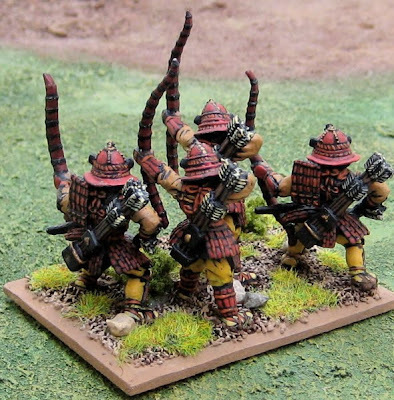 I’ve painted them in a red, orange, and yellow scheme to make them Phoenix Clan Samurai. 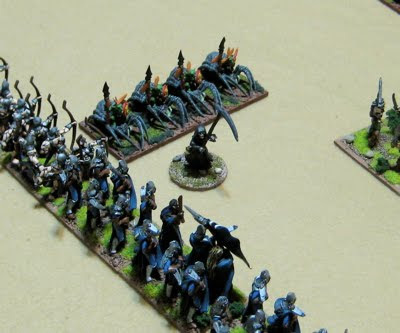 As mentioned before my Phoenix Clan army will be heavy on the magic – three Magician/Shugenja stands and most of the close combat infantry will be summoned creatures (the ghostly “Void Guard” or Earth Elementals) or magically protected (“Avalanche Guard”). Human life is far to precious to the Phoenix to risk any actual people mixing it up in close combat. 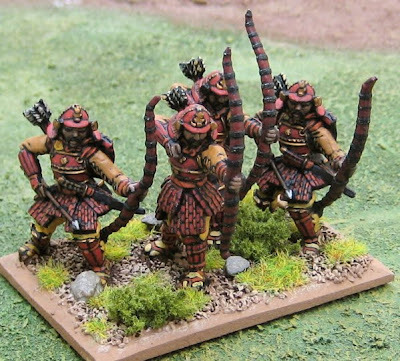 I figured they DO have to have SOME Samurai however, so I’m going to include a couple stands of these Heavy Bow/Samurai Archers in the army. 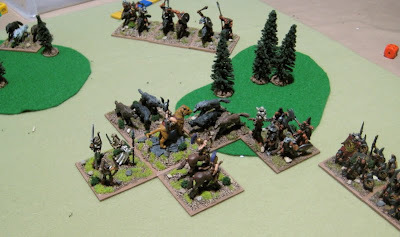 These are some more North American Indians for my Seven Years War British and French. 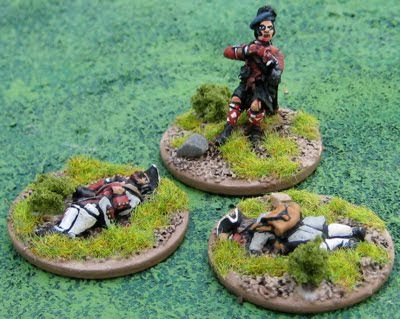 The miniatures are from Old Glory. 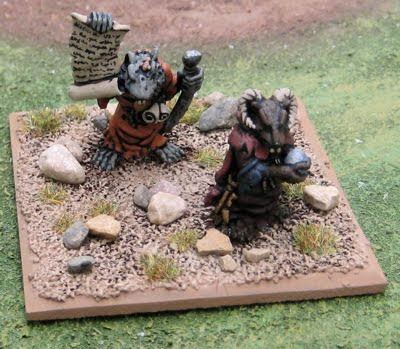 I also finished up a couple of “dead markers” for the French and re-based a Highlander (who had previously been based on a much smaller base – I put him on a bigger one to match all the other dead markers). After finishing up these I cleared off my workbench and started a grand reorganization… a clean slate upon which I will heretofore only place small numbers of figures that I intend to finish before moving on to something else… so many choices… where to start…? I may put those Phoenix Clan Samurai archers back on – because they are so very close to completion… Then I have to do some planning and see what – if anything - I need to get done for the upcoming HOTT campaign, and then work on stuff I might need for the Dark Ages DBA campaign and my Savage Worlds L5R Campaign… and maybe work in some other fun stuff here and there. Those of a gentle disposition - please avert your eyes! 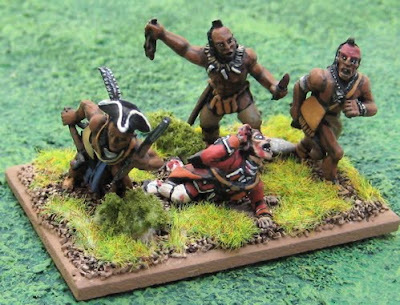 Sometimes I just love Old Glory… cheap like dirt (well, compared to many of the other options out there…) and occasionally you get little gems in a pack like this “British soldier being scalped” vignette…. These, I think, are some sort of Kryomek(?) aliens. They were easy, and so now they’re done! 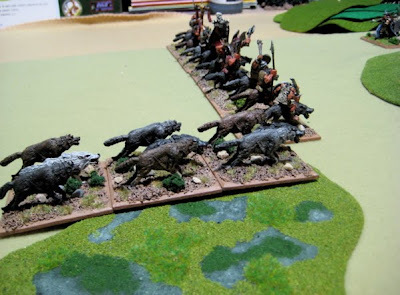 After last weeks game at John’s I got thinking again about gaming the Seven Years War with the DBA Extension for 1500 – 1900AD… so I got working on finishing up a few things I needed to finish up two opposing 12 stand DBA armies. Actually I had all the French ages ago. 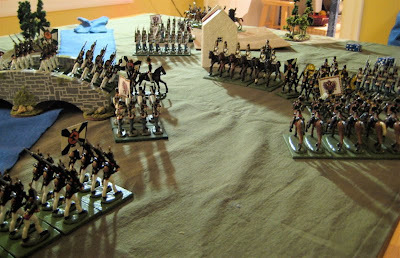 Indeed I am only two stands shy of being able to field two complete French forces. 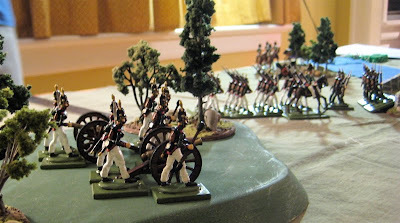 These are the British cannon and crew I have just finished. The figures are all from RAFM. Here are the two French General elements (both I am classifying as “Light Horse”). 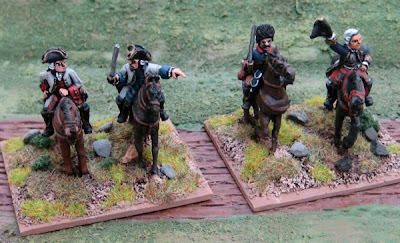 The only newly painted figure is the cavalryman on the base with Le Marquis de Montclam – the others have simple been rebased… All of the figures here are from Old Glory. Here is the entire British force. There’s actually 13 stands in the picture – all of the british I have. Right now, that’s 1x Light Horse (General), 7x Muskets (Line Infantry), 2x Muskets (Grenadiers), 2x Cannon, 1x Jägers (Rangers). Here is the entire French Force. Again this is all the stuff I have currently painted. 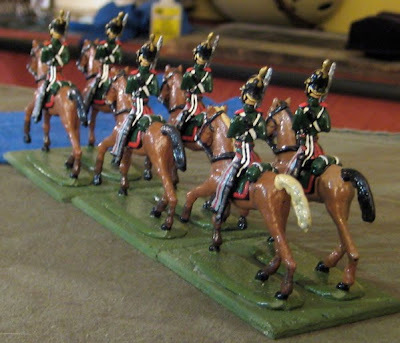 It amounts to; 2x Light Horse (Generals), 3x Light Horse, 2xCannon 15x Muskets. Eventually they will be organized similarly to the British. These, as mentioned were modeled, moulded and cast by my friend John Bertolini. Because of their dynamic pose I wasn’t able to quite get two full ranks on to the base. 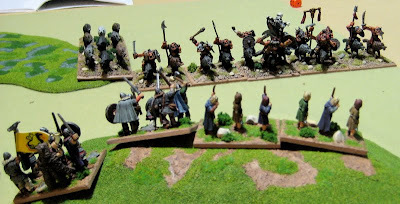 Even as they are there’s a bit of the figures bases bulging at the back of the stand but that should be able to be hidden with some careful application of static grass and shrubbery…. 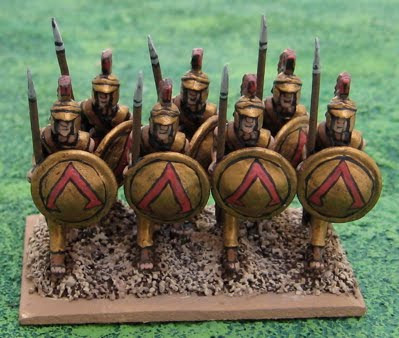 I probably shouldn’t have done any basing details and left that to Jackson – so the base of this stand would match the rest of the stands in his army…. Ah well, he can repaint it and then add whatever kind of details he wants. 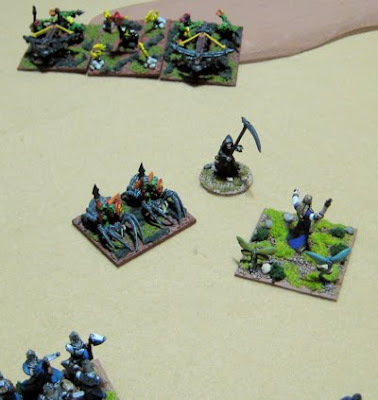 I couldn’t just hand over a blank base with a bunch of guys glued to it!? 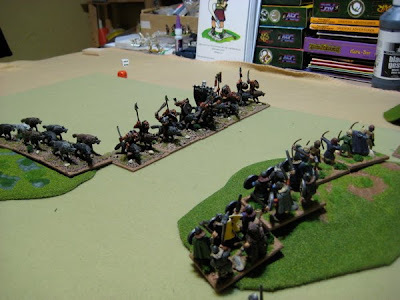 These are some more of Jolo’s old Skaven (Citadel miniatures produced in the late ‘80s/early ‘90s, under license, by Rafm) – repainted and rebased for Hordes of the Things. 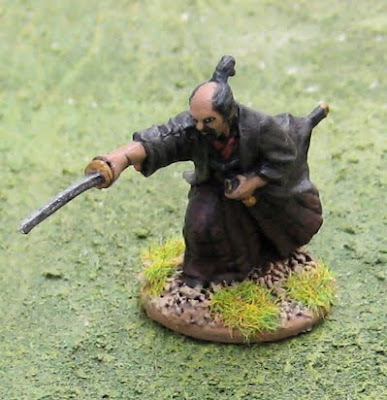 Another samurai from Perry Miniatures. 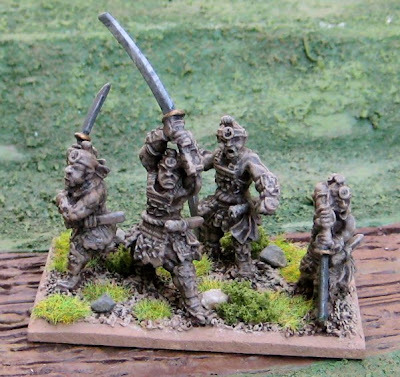 Dammit I’m GOING to finish those wretched samurai archers one of these days!?! 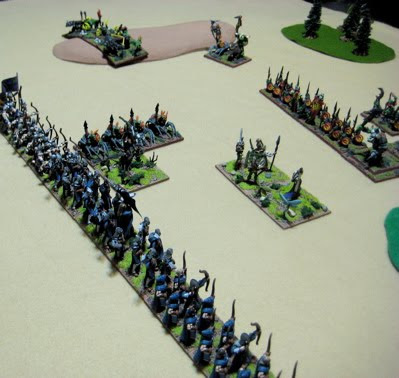 After that I may switch gears to work on some other fantasy bits and options for some of my other HOTT armies as the 2nd Annual HOTT Campaign Weekend is a scant SIX WEEKS AWAY!! 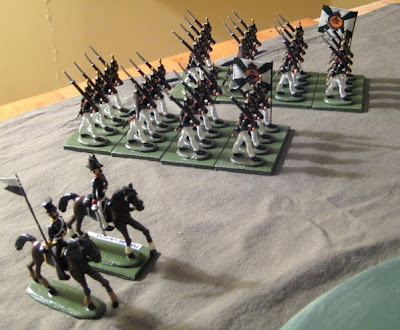 This past Tuesday me, Gary, Rick and Jackson all wandered over to John’,s for a change, to play with his pretty toy soldiers. 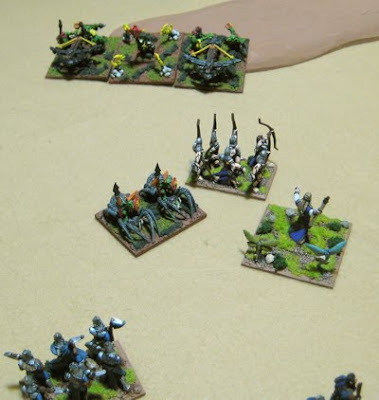 All the figures are 40mm home-cast toy soldiers that John modeled, moulded, cast and painted himself. 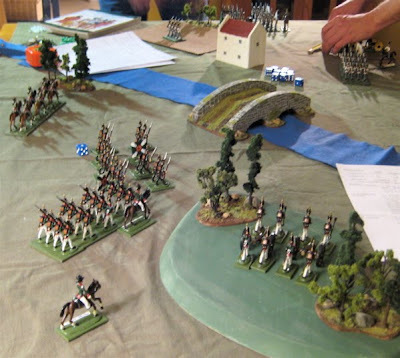 I know the battle took place in the mid-1800s and that Jackson and I played the Russians and Gary and Rick played the Austrians. The Russians wanted to blow up the bridge and the Austrians wanted to capture it intact. The Russians objective was to take and hold the bridge for five turns (how long it would take the engineers to prepare it for demolition. 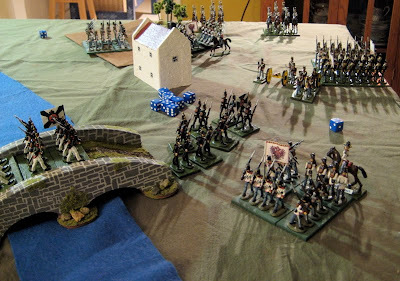 The Austirans simply had to be in possession of the bridge at the end of the game. 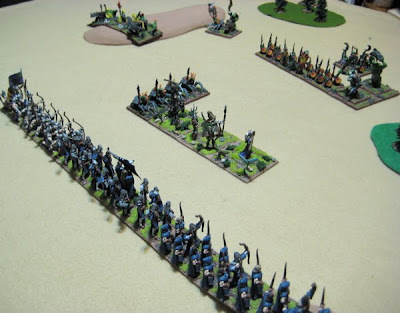 Either side could win by eliminating half of the opposing force. 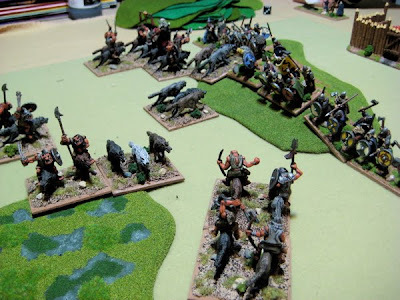 Given that we had identical forces, and John assured us that his home-cooked riles were “fast and bloody” I figured the battle would simply be determined by whole killed the mostest the fastest. 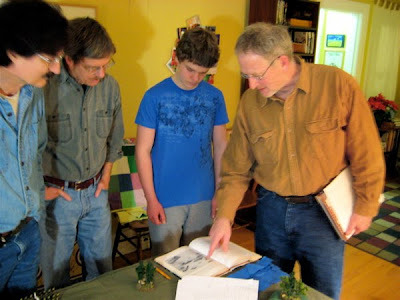 John (right) explaining the scenario. 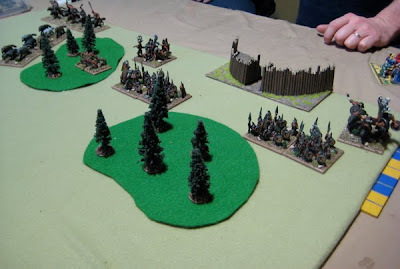 The Russians initial deployment. 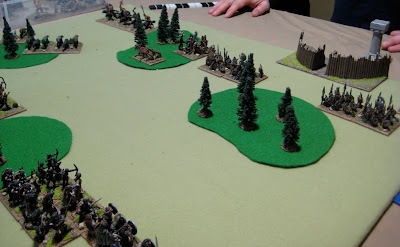 WE were to mark down which units were to start on the table and where (could be 6” in from any point 18” from the corner of the table, only 6 of 9 units could start on). 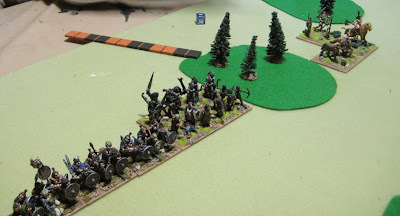 Our plan was to rush forward the light infantry in open order to sieze and push beyond the bridge, followed closely by a line infantry unit in a march column. 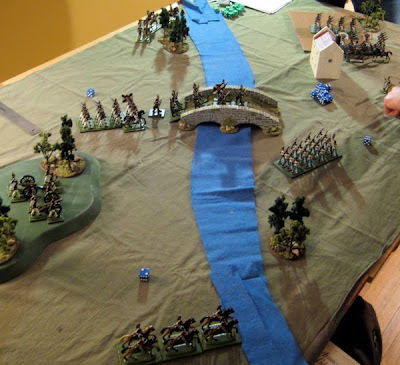 The two cavalry squadrons also began on the table and went to opposite flanks to ford the river and threaten the enemies flanks. The guns were to get up on the hill and deploy as quick and possible and fire in support of the advance. 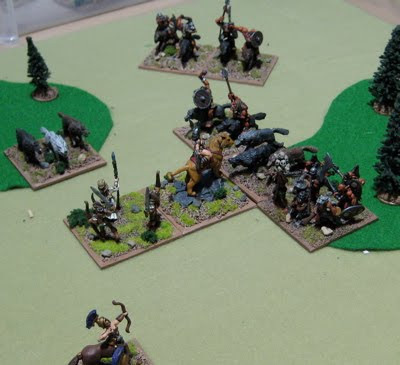 Rick and Gary moving up the Austrians. Everything going smoothly and according to plan. 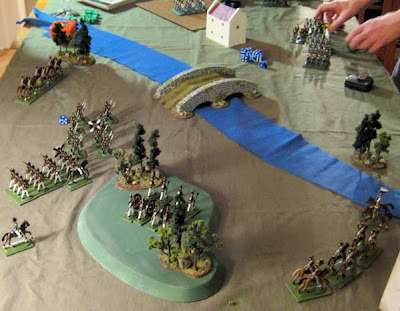 The Russian Light Infantry storm the bridge. Russian guns setting up on the hill. 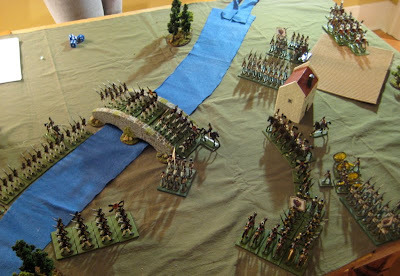 Another shot of the Russian Light Infantry rushing across the bridge. 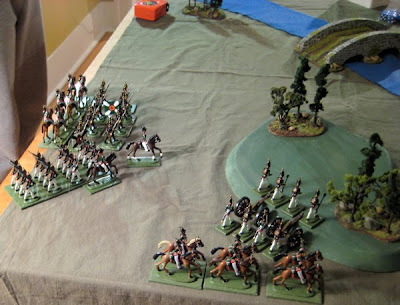 A Squadron of Russian cavalry prepare to ford the river. 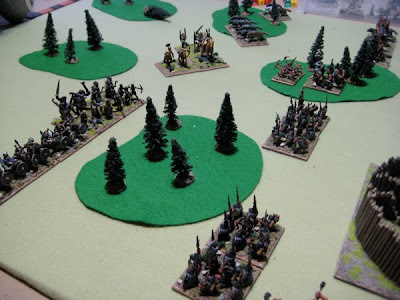 Austrian reinforcements arrive right in the thick of it! Big Mess from a different angle. In the end I think the Russians coup-de-main gambit paid off and we won…? 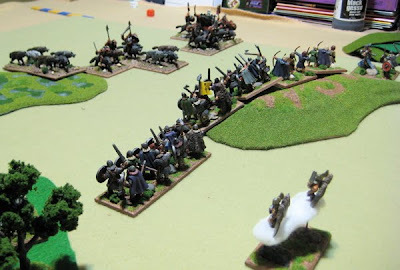 When John said “fast and bloody” I was expecting something faster and bloodier than other games we have played (like Ever Victorious Armies – which is VERY fast and bloody). 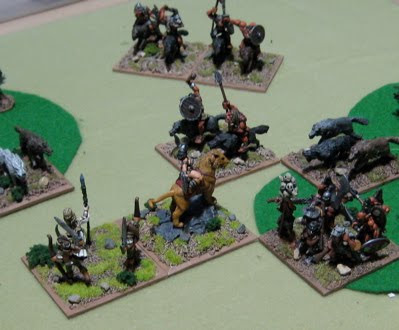 There were a LOT of halving modifiers which very quickly reduced a units firing effectiveness to essentially zero… "for your units attack roll a single die, if you roll a 6 one guy in the enemy unit dies…" HUH!? Seriously!? Anyway, it was super fun getting to go to Johns and play with his marvelous toys! These are Lions (obviously). 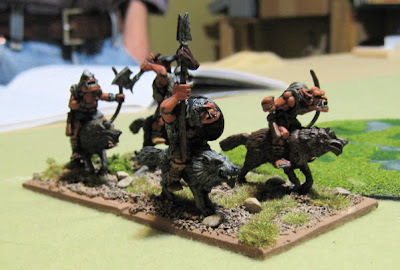 The figures are Clan War figures from AEG (Lion Clan “Warcat Pride”). 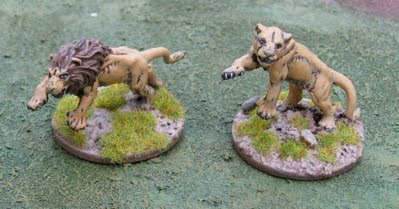 Ostensibly these are for a HOTT Lion Clan army (when I ever get around to that…) but could really be used as “Beasts” for ANY army I could reasonably throw them into… Narnian, any HOTTified ancient African or Middle East army, and I’m sure Amanda will want to use the ones with just lionesses for her army of “HOTTies”. Damn… I totally forgot to paint their noses… CURSE THESE CLOSE-UP PHOTOS!!! Two more of the same, singly-based for pulpy adventures and skirmishing on the Dark Continent… or perhaps in the lair of an eccentric evil genius (who just keeps them as “pets”)!? 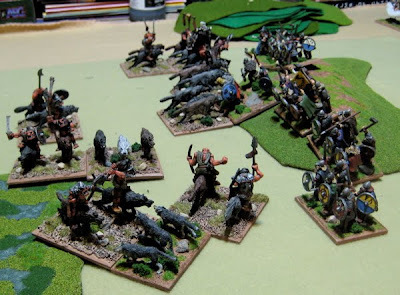 In order to boost my lagging painting rate and lower the aquired-to-painted ratio I give you a bunch of stuff that was really easy to paint – because here at Tim’s Wargaming Blog QUANTITY is job #1! Seriously though… I didn’t paint these JUST because they’d be quick and easy they are some really cool figures. Okay, it was PART of the reason – but it was as much about finishing stuff to boost morale (which wanes some around here during the dark cold months) than simply for the sake of numbers. These are from the “Dream Warriors” box set from RAFM. I picked them up recently off of ebay, and at first I thought they might have been part of a Call of Cthulhu line. Having a closer look at the box it seems like they were just part of a fantasy line. I’m not entirely sure how I’m going to use them. 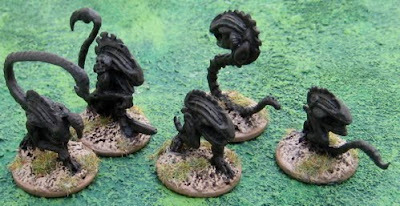 Obviously I’ve based (most) them for Hordes of the Things - but what should they be classed as…? SNEAKERS…? 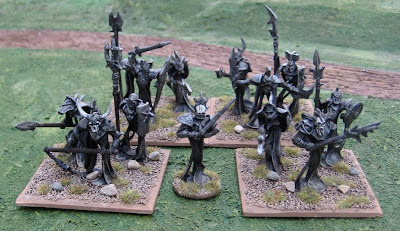 The ghostly/spectral aspect might work… but how would I ever need four stands of them!? HORDES…? This kind of works for me. The not-entirely-corporeal in form could make them not-so-effective in terms of sheer physical punishment they can dish out… Indeed their effect my not even be physical! Rather if they ever “destroyed” a stand it could be that they’ve so terrorized them they have fled the field of battle. The fact that they’re not alive to begin with means they can keep coming back if they have been “disrupted”. Fliers…? Ghosts undeterred by terrain or other worldly things (like units of enemy soldiers) could feasibly move at a very high pace. Not terribly effective. Foiled by woods and built up areas…!? How do you explain that!? These are Phoenix Earth Elementals. The Phoenix Clan are all about the magic – why send in a precious live to fight those who INSIST on fighting when you can have magic do your bidding. I think I will classify them as BLADES. They are Clan War figures from AEG. I’d like to say more easy stuff… LOTS more easy stuff… but I just don’t have any easy stuff that I really want to work on!? 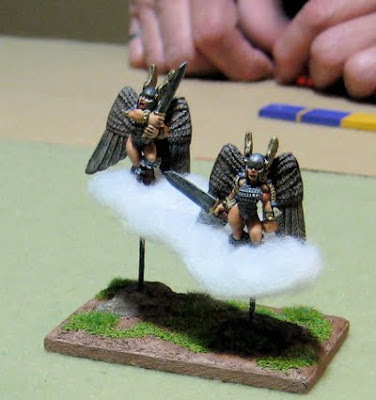 So I think I’ll try and carry on with the Phoenix Clan HOTT army. Maybe after that (or concurrently) I'll do a bit of work on the Unicorn Clan as well as bits and bobs of this and that… we shall see. It was just over a year ago that I started playing a LOT of Hordes of the Things. 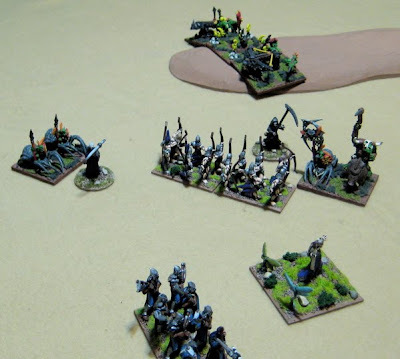 I had started playing DBA 19 years previous (though there has been a few LARGE gaps) and had owned both editions of HOTT, but I never really played it at all until last Xmas when JC was in town and decided to play a game. 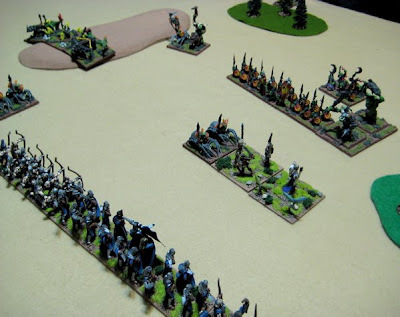 It seems like it’s been a while since I played, but that’s just not true… up until November I was running a HOTT email campaign and was weekly playing out the battles and posting reports on this very blog…. 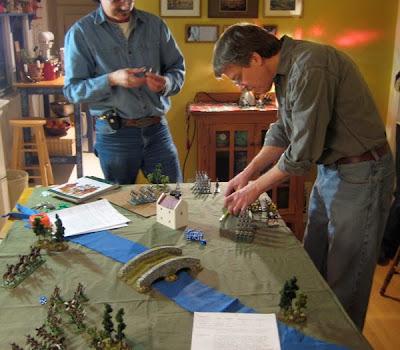 Mind you a LOT of those games I didn’t actually PLAY in – I was mostly there as “provider-of-miniatures”, Games Master/Referee for others that came over and played the games, as well as chronicler…. 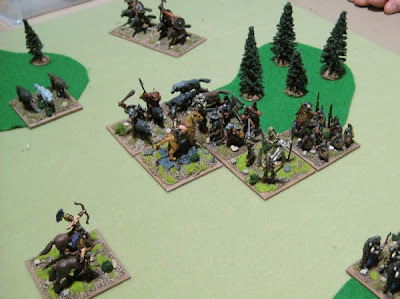 Here are some brief reports of games played over the last couple weeks or so. I actually got to PLAY one of the games. Then I got to introduce my good friend John to HOTT (though Amanda played the opposition). Finally, last night Gary and Rick came over to play a game. We played with d6+1 PIPs. 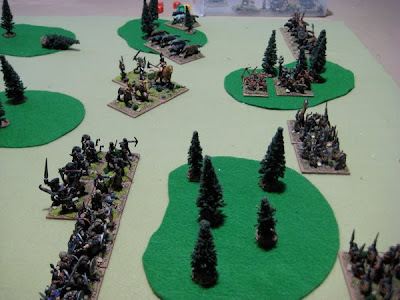 The first bold moves – The elf magicians surge forward and BLAST the Enemy Hero… HANG ON!!! Recoiled?! Heroes don’t RECOIL from Magicians!? Or was he proposely keeping it back out of their 600 pace range… Hmmmm that’s what happens when you write these reports a couple weeks after the fact! 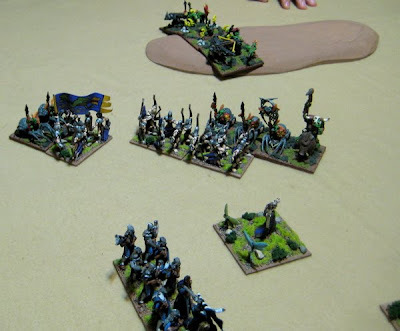 Magicians move forward as does the entire elf line. 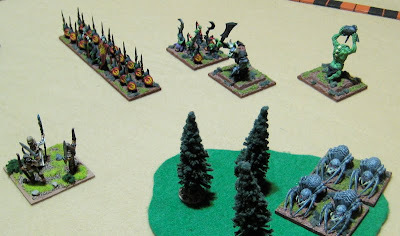 Spider riders and Hero wrecking havoc on the flank! 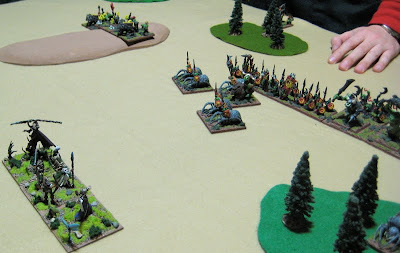 What’s with the Spider rider moving there…? Wow that trolls got gumption! Trying to go toe-to-toe with an elfie magician! The next game was on New Year’s day and, as I mentioned, I was introducing my friend John to the game. 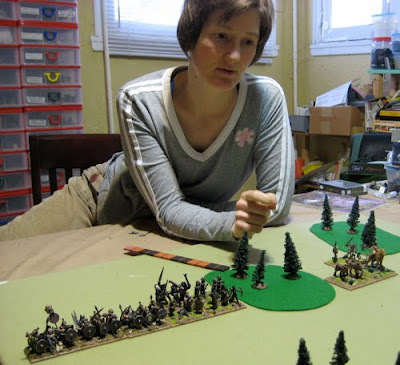 Amanda had tried to go out and see Avatar but couldn’t get in and so got back home just in time to play her army of “HOTTies” against a goblin horde played by John. 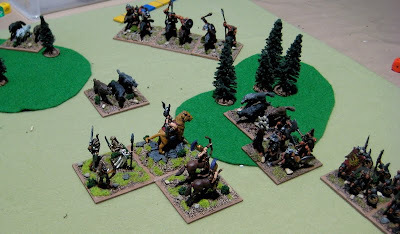 The Orcs prepare to defend their homeland against the invadin’ wimmin folk. 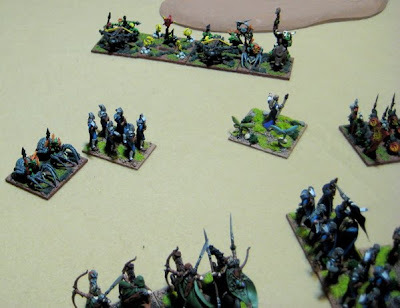 The Sapphic League arrays for battle. 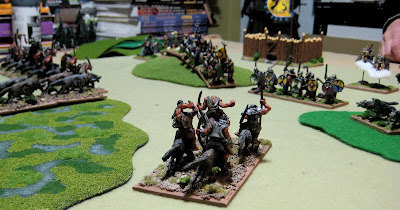 Ponderously the two sides advance. Dum-de-dum… What the hell?! Was everybody rolling lots of ones for PIPs or was I a little triggerhappy on the opening moves... ? BLAM! General Libby pulls it out of the fire! Hang on… Why is that beastly frontal opponent recoiled? 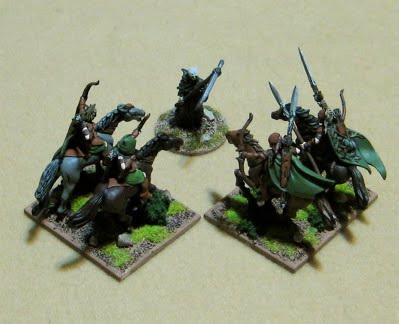 They should have been quick-killified by the (mounted!) Hero!! Ah well, it was his first game… maybe she was taking it easy on him. 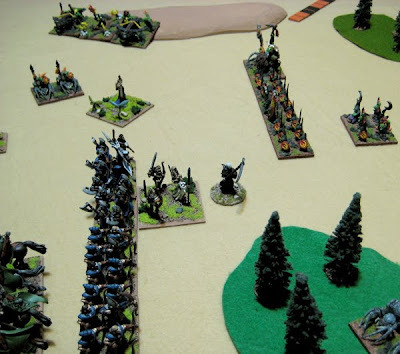 Some general re-deploying going on – getting the line of infantry moving forward and getting the General and magician out of some tight spots. Amanda has no such compulsions… No mercy, no quarter – BLAM! Dead General, game over! One of Gary’s new elements was a stand of Valkyrie Fliers… WE’ve never used fliers before and so it caused us some brain injury trying to figure out how exactly they worked! I still don’t think Gary and Rick believe me that they do exert a zone-of-control when they’re flying. 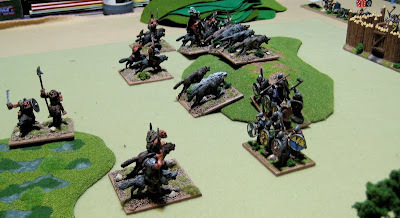 The mounted horde rushes forth! 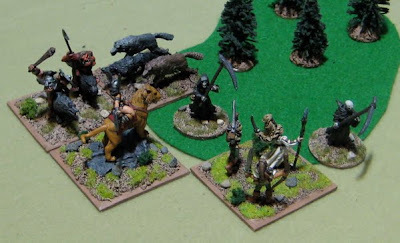 Gary also brought along some of his beautiful new terrain – including this swap! 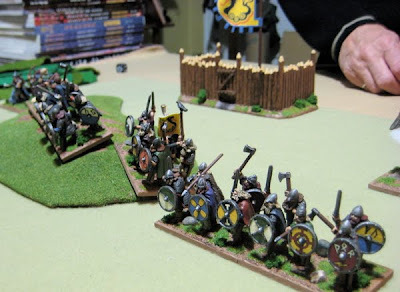 The defenders of the kingdom take positions on the (STEEP) hill before the stronghold. GAH! Enough with the redeploying!? Get in there already!? Here’s what was left standing. 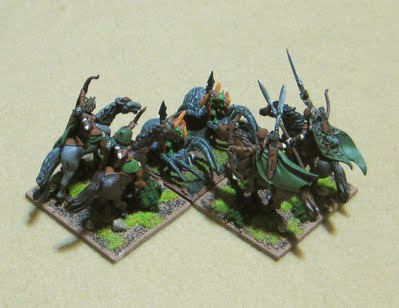 The mounted hordes of Grick were victorious! I feel like I’ve been doing a LOT of prepping – cleaning, basing, priming, organizing – and not so much painting lately… I need to do some PAINTING! 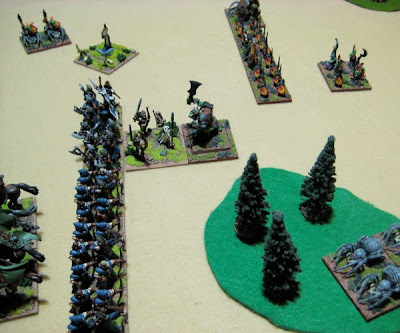 Next Week my other firned John is going to be hosting a game at his place – using some homebrew rules and his 40mm home-cast mid-nineteenth century “toy soldiers” – I’ve been totally looking forward to this for some time - so stay tuned for that!